Nevada 667 (Kietzke Lane) curves southwest over the Truckee River on a pair of 1966-built bridges. Photo taken 06/28/14. Nevada 667 constitutes a nearly four mile route along a five lane boulevard or divided four lane arterial through Reno. Overlaying Kietzke Lane, the state route branches north from U.S. 395 Business (South Virginia Street) around the east side of the Reno-Sparks Convention Center to Moana Lane. Commercial frontage ranging from auto dealerships, retail stores and industrial businesses line much of the route north to the bridge across the Truckee River. The northern extent curves east to end at the Kietzke Lane intersection with Galletti Way. Galletti Way straddles the Sparks city line north to Business Loop I-80 (East 4th Street / Prater Way) adjacent to a diamond interchange with Interstate 80. SR 667 formerly extended slightly further north to Business Loop I-80 (Victorian Way) and Prater Way. Kietzke Lane also carried U.S. 395 temporarily northbound from South Virginia Street to East 2nd Street, and from Mill Street southward. The short lived alignment was in place during construction to extend the U.S. 395 freeway southward in 1982. This northbound reassurance marker precedes the Kietzke Lane intersection with Vassar Street. Photo taken 06/28/14. Mill Street heads northwest from the cargo facilities of Reno-Tahoe International Airport (RNO) to meet SR 667 (Kietzke Lane) just west of I-580 & U.S. 395. Photo taken 06/28/14. Kietzke Lane north carried U.S. 395 temporarily from South Virginia Street to East 2nd Street prior to completion of the I-580 freeway to the east. Mileposts for SR 667 still reference the U.S. 395 distance from the south Washoe County line. Photo taken 06/28/14. Continuing north 0.4 miles from Mill Street, SR 667 (Kietzke Lane) intersects East 2nd Street and the west end of SR 653. SR 653 connects Reno with industrial areas of Sparks to SR 659 (McCarran Boulevard). Photos taken 06/28/14. Another older milepost with the former mileage of U.S. 395 in Washoe County appears for SR 667 at East 2nd Street. Photo taken 06/28/14. Nevada 667 arcs northeast from East 2nd Street to both span the Truckee River and pass below I-580 & U.S. 395 (Martin Luther King, Jr. Memorial Highway) at Fisherman&apos;s Park. Photos taken 06/28/14. Approaching the Sparks city line and the northern terminus of Nevada 667. With Kietzke Lane under local control beyond Galletti Way, commercial truck traffic is restricted. Photo taken 06/28/14. Galletti Way runs south along Fisherman&apos;s Park to SR 653 (Glendale Avenue) and north to connect SR 667 with Business Loop I-80 (Prater Way) and Interstate 80. Photos taken 06/28/14. Kietzke Lane continues 0.4 miles north from Galletti Way to pass under both the UP Railroad and I-80 to become Rancho Drive at Victorian Avenue (Business Loop I-80). Photos taken 06/28/14. Kietzke Lane angles southwest from Rancho Drive and Business Loop I-80 (Victorian Avenue) to immediately meet an on-ramp to the adjacent I-80 ramps for Interstate 580 south and U.S. 395. This assembly was updated by 2016 to include a trailblazer for I-580. Photo taken 07/19/09. The single lane ramp from Kietzke Lane (former SR 667) south to the I-80 interchange with U.S. 395 takes motorists south toward Carson City and Minden-Gardnerville and north to Cold Springs and Susanville, California. I-580 was fully signed along U.S. 395 south from I-80 by October 2012. Photo taken 07/19/09. Kietzke Lane passes under the Union Pacific Railroad tracks on a short controlled access section to the truncated beginning of SR 667 at Galletti Way. Photo taken 07/19/09. Nevada 667 southbound begins and passes below I-580 & U.S. 395 and across the Truckee River. Photo taken 06/28/14. 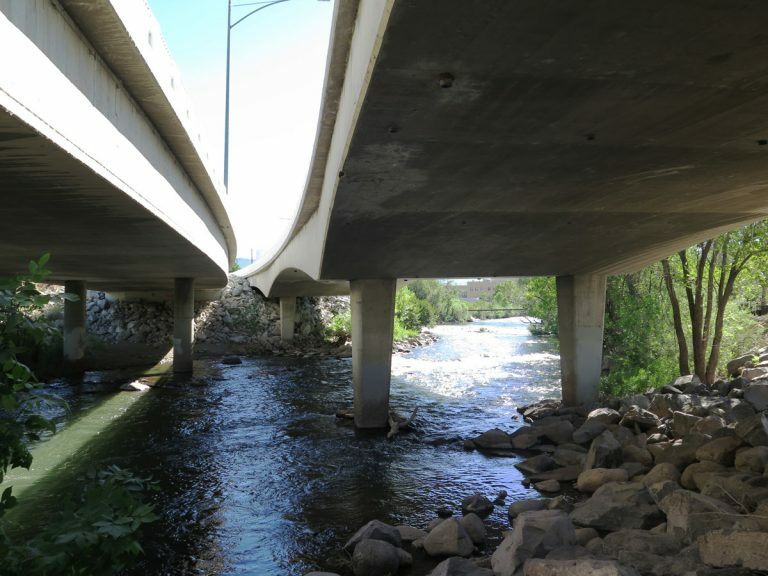 The Truckee River bridges for SR 667 cross over a multi use path linking sections of Fisherman&apos;s Park. Photo taken 06/28/14. Turning to face due south, SR 667 (Kietzke Lane) expands to include a continuous center turn lane beyond forthcoming East 2nd Street. Photo taken 06/28/14. Nevada 648 travels east along 2nd Street from Nevada 667 (Kietzke Lane) to become Glendale Avenue across the Truckee River. The state route totals 2.66 miles east to Nevada 559 (McCarran Boulevard) in Sparks. Photos taken 06/28/14. Kietzke Lane expands further to include on street parking and bike lanes beyond Nevada 648 (East 2nd Street). Photo taken 06/28/14. Mill Street angles southeast from Kirman Avenue east of Downtown Reno to cross paths with Kietzke Lane ahead of an interchange with I-580. The five-lane arterial extends east along the north side of Reno-Tahoe International Airport (RNO) to an industrial park area and Nevada 659 (McCarran Boulevard) in Sparks. Photo taken 06/28/14. SR 667 milepost affixed to the traffic signal post at Kietzke Lane and Mill Street. The 25.32 miles to the Carson City line alludes to the temporary alignment of U.S. 395 along Kietzke Lane south from Mill Street. Photo taken 06/28/14. The subsequent signal along Kietzke Lane southbound operates at Vassar Street. Vassar Street heads west to Vaughn Middle School and east below I-580 and U.S. 395 to Terminal Way. Photo taken 06/28/14. Milepost 24.70 for SR 667 south at Vassar Street. This distance again referenced the U.S. 395 mileage to the Carson City line. Photo taken 06/28/14. The first reassurance marker for Nevada 667 stands south of Vassar Street along a controlled access section of Kietzke Lane. Photo taken 06/28/14. Forthcoming Nevada 653 (Plumb Lane) leads east from Kietzke Lane directly to the passenger terminal of Reno-Tahoe International Airport (RNO). Photo taken 06/28/14. Plumb Lane constitutes a commercial arterial east to RNO Airport and west to Shoppers Square Mall at U.S. 395 Business (Virginia Street), and Lakeside Plaza. Photo taken 06/28/14. SR 653 follows Plumb Lane east for 0.6 miles to Terminal Way and RNO Airport. The state route used to extend west along Plumb Lane to Virginia Street. Photo taken 06/28/14. A wide asphalt traffic island separates merging traffic from Plumb Lane east onto SR 667 south at this milepost. Photo taken 06/28/14.